Set atop a grassy pasture overlooking the Atlantic Ocean, this crumbling, ivy-covered castle is one of Ireland’s most romantic ruins. The castle, which originally dates back to the 16th century, was damaged during the 17th-century War of the Three Kingdoms. Now, only parts of the structure, such as its high stone walls, remain in place. 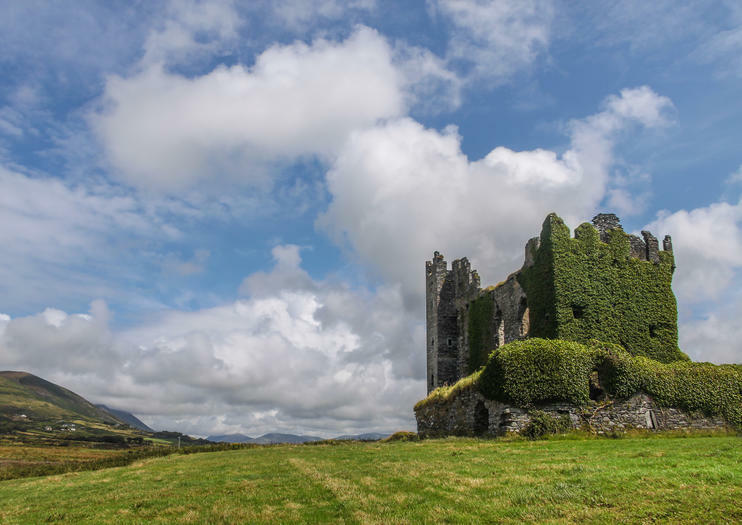 The castle is relatively undiscovered and is often overlooked by tourists exploring the Ring of Kerry. As the castle is situated on private land and the ruins are somewhat unstable, Ballycarbery is not open to the public. Visitors can, however, park in a nearby lot, where some background information on the castle is provided. Admire the structure from afar, and take photos of the picturesque ruin. Some private Ring of Kerry day tours do make photo stops at the evocative site. Bring a camera; the romantic ruins make an excellent photo opportunity. Viewing is from the roadside; wear comfortable shoes and rain gear. Respect the signs on the fence barring public admission and do not attempt to cross beyond them. Ballycarbery Castle is about 2 miles (3 kilometers) from Cahersiveen, County Kerry in an area locals call “over the water.” From Cahersiveen, follow Castlequin Road and then turn left when you see the sign for Ballycarbery Castle. Driving here involves navigating narrow country roads, so you may prefer to go as part of a guided tour. Because of its off-the-beaten-path setting and the lack of public access, Ballycarbery Castle is rarely busy. Even in peak summer season, there’s a good chance you’ll be the only sightseer photographing the structure. Other historical attractions situated not far from Ballycarbery Castle include Leacanabuaile Fort and Cahergall Fort; these ancient stone forts are less than 5 minutes away from the castle ruins by car. The castle is also just a short drive from Valentia Island, home to the Skellig Experience Visitor Centre, and the Daniel O'Connell Memorial Church in Cahersiveen, which is named after the 19th-century Irish political leader and campaigner for Catholic emancipation.